Black garlic is aged white garlic, made by heating garlic over the course of several weeks, which results in a black bulb. With a sweet taste similar to balsamic vinegar, it’s prized for its health benefits in Asia. Many ancient cultures used black garlic as a medicinal and culinary plant. It had many uses, including as a diuretic, antibiotic and anti-parasitic. The nutritional power of black garlic is 10 times greater than that of fresh garlic as it has 10 times more allicin, the active compound in garlic, than fresh garlic. So the question is, how can black garlic benefit you? JNK and p38MAPK are abnormal cells responsible for the onset of many types of cancer. Preliminary research suggests black garlic decreases their ability to make more cancerous cells. Studies have also shown that it is toxic to a wide variety of cancers. It stops the growth and division of some cancer cells such as A549 lung cancer cells and HepG2 hepatic cancer cells (x). A study on the effect of black garlic on leukemia showed that it can stop the growth of the cancer cells by stimulating the molecules responsible for killing them off. It also prevents the repair of the DNA in cancer cells, which ultimately destroys them (x). High concentrations of black garlic may kill cancerous cells in patients with stomach cancer. 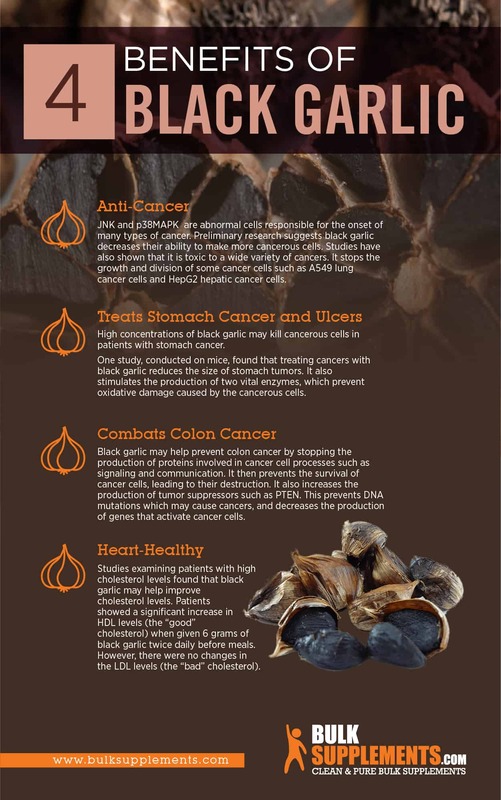 One study, conducted on mice, found that treating cancers with black garlic reduces the size of stomach tumors. It also stimulates the production of two vital enzymes, which prevent oxidative damage caused by the cancerous cells (x). Black garlic may help prevent colon cancer by stopping the production of proteins involved in cancer cell processes such as signaling and communication. It then prevents the survival of cancer cells, leading to their destruction. It also increases the production of tumor suppressors such as PTEN. This prevents DNA mutations which may cause cancers, and decreases the production of genes that activate cancer cells (x). Studies examining patients with high cholesterol levels found that black garlic may help improve cholesterol levels. Patients showed a significant increase in HDL levels (the “good” cholesterol) when given 6 grams of black garlic twice daily before meals. However, there were no changes in the LDL levels (the “bad” cholesterol) (x). 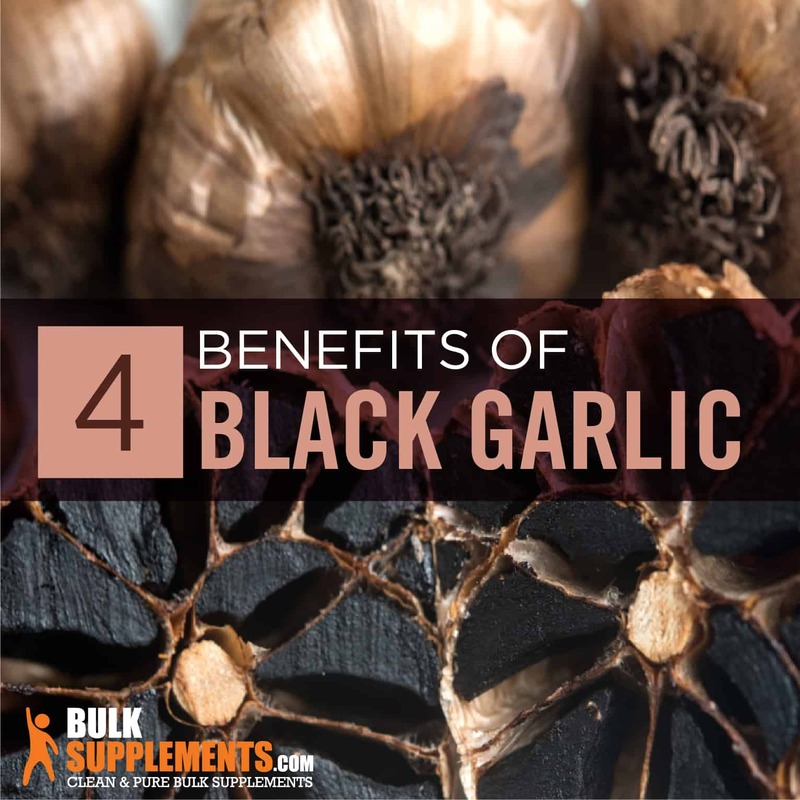 In addition to raising good cholesterol levels, black garlic is rich in organo-sulfuric compounds that can relax the blood vessels and lower blood pressure. One study showed that patients who took two black garlic tablets daily for two weeks showed a significant decrease in their blood pressure levels (x). Black garlic’s antioxidant properties are 10 times more powerful than fresh garlic. These powerful compounds protect cells from oxidative damage that leads to signs of aging and disease. Black garlic converts unstable allicin into more stable compounds that have antioxidant effects. The juice of black garlic also reduces harmful reactive substances that can damage the liver, blood, and kidneys (x). Black garlic contains the antioxidant 5-HMF, which deactivates the nuclear factor kappa B, a protein chain. So what exactly does that mean? If this protein chain is over-stimulated, it can lead to inflammatory conditions, auto-immune diseases and cancer. By deactivating this chain, black garlic potentially reduces the risk of these diseases. The protein chain is also responsible for the release of cytokines, proteins that control immune responses and can increase pain and trigger inflammation. (x). Cytokines play a role in the pain and inflammation present in arthritis, atherosclerosis and asthma. Black garlic combats cytokine activity but shutting down the nuclear factor kappa B. How Does Black Garlic Fight Inflammation? A study conducted on macrophages (a type of immune cell) suggests that black garlic reduces inflammation by decreasing nitric oxide (NO) production and cells that trigger inflammation. It also deactivates the proteins and enzymes involved in the synthesis of nitric oxide and inflammatory cells (x). This ultimately leads to fewer macrophages, which are a major cause of tissue damage associated with chronic inflammation. Research is ongoing, but this is potentially beneficial news for those with conditions that cause chronic pain, like arthritis and multiple sclerosis (MS). Because black garlic stops enzymes responsible for inflammatory responses–which trigger allergies–it also prevents allergic responses (x). Another study showed that black garlic inhibits cell activity that sparks inflammation and allergies, boosting your immune function (x). Studies conducted on mice showed that black garlic could help treat oxidative liver damage. Black garlic also enhances liver function by increasing its metabolic action and decreasing fatty deposits, which lead to liver disease (x). Research suggests that black garlic can significantly decrease body weight, adipocyte tissues, and stomach fat distribution. So how does black garlic battle the bulge? Scientists believe it removes fat cells by preventing them from forming (x). 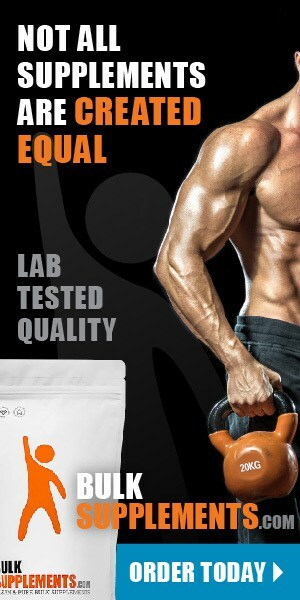 It thereby lowers the conversion of concentrated fats into fat cells. Then it breaks them down and converts them into energy, meaning you’re less likely to pile on the pounds (x). MSG (Monosodium Glutamate) is a food additive that damages cells in the cerebellum and hippocampus–vital parts of the brain that control muscle coordination and memory. Black garlic may reduce the damage MSG causes to the brain by protecting brain tissue (x). In doing so, it could help prevent age-related cognitive decline and memory loss. The side effects of garlic vary depending on the form you take (x). Talk to your doctor before taking black garlic if you are pregnant or nursing. Do not apply black garlic topically if you are pregnant, as it may cause irritation. Taking small amounts of garlic orally for a short-term is safe in children. Large doses are not safe and may even be fatal. However, to date, there have been no reported fatalities among children who have taken garlic orally. Do not apply black garlic topically to your child’s skin, as it may cause damage similar to burns. Garlic may increase the risk of bleeding, so it is not recommended for patients with chronic bleeding disorders or after surgery. Taking black garlic may cause a drop in blood sugar. In diabetic patients, garlic decreases blood sugar levels significantly and may even lead to diabetic coma. Talk to your doctor before taking black garlic if you have diabetes. Black garlic may cause gastrointestinal distress; talk to your doctor before taking it if you have a history of stomach or digestive issues. Garlic lowers blood pressure. This is a benefit for people with high blood pressure. However, it may cause a significant decrease in blood pressure in people with low blood pressure. High amounts could even lead to a coma. Do not take black garlic if you have a history of low blood pressure. Black garlic extract powder contains a high concentration of its beneficial compounds, like antioxidants. As a dietary supplement, take 800 mg (scant 1/3 tsp) once daily, or as directed by your physician. Black garlic may reduce inflammation associated with skin infections (especially fungal infections). It is available as a 0.4% cream, 0.6% gel, and 1% gel. Apply twice per day for a week, or until irritation subsides. Highly valued for its potent health benefits, black garlic is a fermented form of garlic that benefits nearly all areas of your health. It fights allergies, boosts your immune system, keeps your heart healthy, supports cognitive function, and may even help prevent cancer.